You could say I'm having a bit of a fling with Spring right now. Make up wise that is. Something about the pastels and dewy bases draw me in like a magpie to a milk bottle so it's not surprising I have several new additions I can't wait to show you! First up, a foundation that has finally taken over my two year love affair with Bourjois Healthy Mix and is pretty much complexion perfection- L'oreal Paris True Match. An incredibly light and runny foundation that melts into the skin instantly when applied with the Real Techniques Expert Face Brush, setting to a beautiful satin finish- glowy whilst still incredibly skin like with a very good medium coverage. It also stays in tact throughout my long working days and 'N2 Vanilla', as the name suggests, is a true match for my Spring skin. At a reasonable £9.99 this nicely packaged bottle has totally blown me away and even curbed my craving for Nars Sheer Glow. Praise indeed. Next we have a repurchase that also blows me away each time I wear it; Topshop 'Whimsical' Lipstick. As much as I'm a sucker for a buttery balm this blue skied time of year, I'm also partial to a good Spring matte and luckily the velvety formula of this lipstick doesn't have the drying downside. Even though I do find myself topping this up a fair amount, 'Whimsical' is totally worth it for the colour which I really can't get enough of- a stunning pigmented peachy pink that instantly brightens the complexion and compliments all manner of makeup looks. At just £8 and with that kooky packaging perk, I don't see myself falling out of love with this anytime soon. What products have you caught in a Spring Fling? 'Fashion Playground' is perfect!! These are all fabulous buys, you've tempted me to nip to Boots on the way back from work tomorrow (it's definitely not on my way back). thats nail colour is so pretty! That Essie polish looks gorgeous! I so nearly picked up this Essie polish, but I opted for Truth or Flare. This one is next on my list for sure! I absolutely love the True Match foundation too, it has such a gorgeous finish. Love the look of that Topshop lipstick too! I want a topshop lippy so badly! That color rocks!! Really want to try out the Loreal foundation. That topshop Lipstick is such a pretty shade! 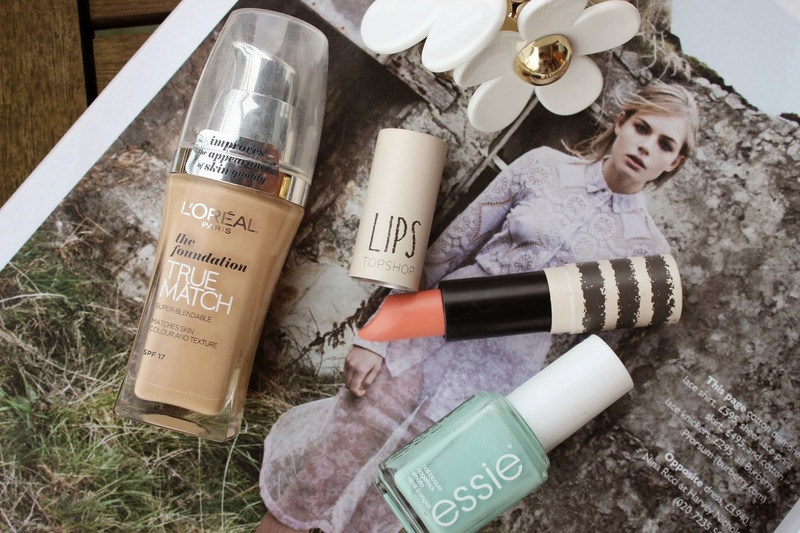 I've been wanting to try that True Match foundation but for some reason never did! I need to! The lipstick and nail polish are amazing too! Nice collection i so much love that essie nail colour.